if penalise msia few hundreds millions for breaking the contract ... huat liao? Edited by Wt_know, 26 May 2018 - 10:29 PM. Eh.. Contract is just on paper only.. If singapore side decide to give chance abit then it will be win win situation leh. The reason is because it's no point trying to damage neighbor relationship just because of this hsr project. So singapore give in abit actually is a good thing. Let's see what pm Lee will do.. Strictly stick to contract like a bullhead or give in abit with some compromise. Hmm..
Edited by Yewheng, 27 May 2018 - 04:13 AM. It should be followed by the continuation of the project because the costs to compensate is too high relative to the cost of construction. Land and facilities was also ceded to Singapore as part of costs already paid. If the intention was merely to cancel, it would have been easier to downplay the compensation and cancel first. Anyway, the rail benefits Malaysians equally as Singaporeans, if not more. So fingers crossed ultimately. 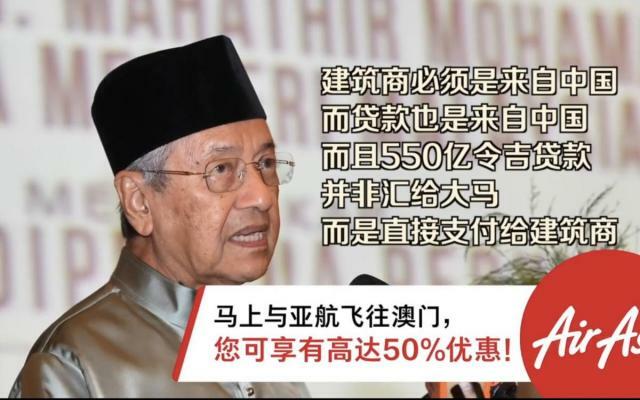 Which Mahathir will prevail at the end? Edited by Showster, 27 May 2018 - 04:49 AM. The M'sia Gov't the most pay S'pore the costs of Jurong Country Club[i wonder is the Clubhouse already torn down.?] & part of the Raffles Country Club,because Construction not started yet. And Malaysia has already give up their railway land in Singapore to Singapore. That, is already a loss to them. Just an update regarding the exchanges from Wiki. HSR may not technically have been a direct exchange for railway land, although the previous friendly exchanges have certainly paved the way to HSR agreement. On 24 May 2010, a meeting between Malaysian Prime Minister Najib Razak and his Singaporean counterpart Lee Hsien Loong in Singapore resolved the relocation issue. In a joint statement after the meeting, they announced that KTM would move out of Tanjong Pagar railway station and establish a station at the Woodlands Train Checkpoint (WTCP), making it the southern terminus of the Malaysian rail network, from 1 July 2011. Malaysia would also relocate its customs, immigration and quarantine facilities from Tanjong Pagar to the WTCP, enabling an integrated border crossing facility between Malaysia and Singapore. Singapore agreed to ensure a connecting bus service between WTCP and a nearby MRT station, and for the National Heritage Board to preserve the station building in any development of the area. Bukit Timah railway station building at Blackmore Drive can also be conserved. Both sides agreed to create a consortium called M-S Pte Ltd, of which 60% equity is owned by Malaysia's Khazanah Nasional Berhad and 40% by Singapore's Temasek Holdings Ltd. The company will be vested with three parcels of land in Tanjong Pagar, Kranji and Woodlands and three additional pieces of land in Bukit Timah (Lot 76-2 Mk 16, Lot 249 Mk 4 and Lot 32-10 Mk 16) in exchange for the return of KTM railway land to Singapore, which was swapped with the Marina One and dUO plots of land, which is located at Marina Bay and Bugis areas in Singapore, in a bid to boost the financial growth in the central business district, and the nearest MRT stations to their M-S Pte Ltd ownage of the land are Marina Bay and Bugis. 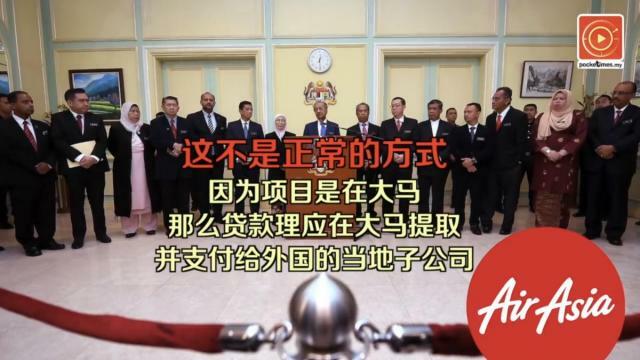 Both sides also agreed to the building of a rapid transit link between Johor Bahru and Singapore to enhance connectivity across the Causeway. After the completion of the link, the KTM terminus may be relocated to Johor. The last train out of Tanjong Pagar was driven by Sultan Ibrahim Ismail of Johor, whose grandfather, Ismail of Johor, had opened the causeway between Singapore and Malaya in 1923. The Sultan had to learn how to drive a train before he was able to perform this task, receiving training from KTM. Two drivers accompanied him to ensure safety. I thought HSR and KTM are two different transactions ? for KTM there was One Marina and the plot at Rochor in exchange. Edited by Wt_know, 27 May 2018 - 01:56 PM. No contracts have been awarded yet. On SG side only land acquisition have been done. So, it is still easy to call off the joint project? How does it benefit Singapore/Singaporeans to a great extent? KUALA LUMPUR: The cost to build the 350km high-speed rail (HSR) linking Kuala Lumpur and Singapore is expected to range between S$20 billion (RM62 billion) and S$25 billion, according to an estimate by the Institute of Southeast Asia Studies (ISEAS). “When YTL [Corp Bhd] provided the estimate for the high-speed rail in 2006, the cost that they proposed was S$2.7 billion,” said ISEAS senior fellow Dr Francis E Hutchinson. 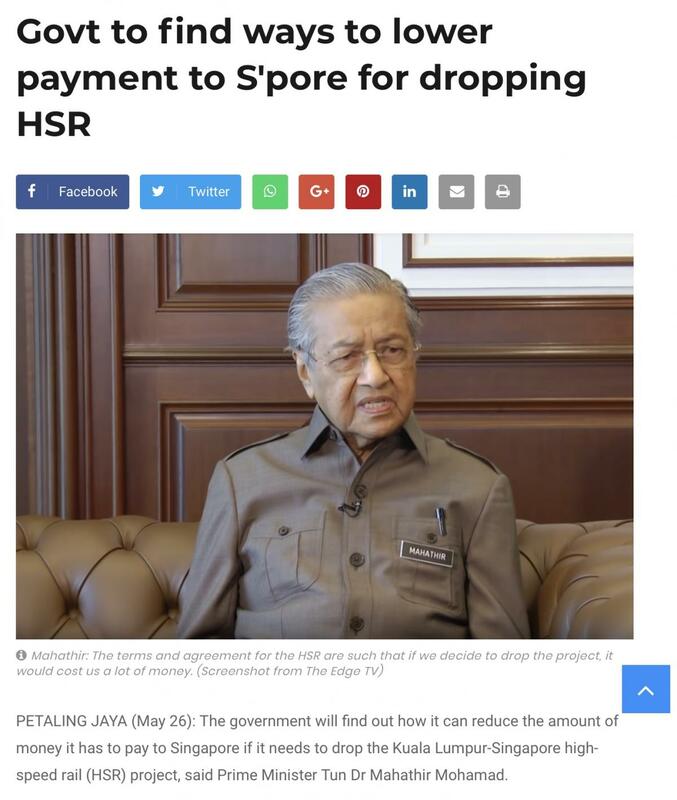 “And then when the government’s Pemandu (Performance Management and Delivery Unit) did their own analysis via a series of labs, it was then revised to around S$5.5 billion. Now the latest I have heard is around S$20 billion to S$25 billion,” he added when speaking at the Affin Hwang Capital Conference. As for the breakdown of the cost, Hutchinson said around US$3.5 billion to S$5 billion is expected to be allocated to laying of tracks, electrification and system integration, all of which is equivalent to US$10 million per kilometre. As for the civil infrastructure cost, which includes building of bridges and tunnelling works. Hutchinson said it may cost around S$15 billion. “The underground cost in general is five times higher than the on-the-ground cost. Hence, even though the Singapore portion is only 6% of the total high-speed rail length, due to land scarcity, the tunnelling cost is expected to be higher,” he said. On the rolling stock, Hutchinson noted that it will be around S$1.7 billion for a 60 four-car train set. “And then, there is also the land acquisition cost that must be taken into account separately,” he said. Based on his calculation, Hutchinson estimated that the one-way ticket price between Kuala Lumpur and Singapore will cost around S$60 to S$65. “The frequency of the high-speed rail service, which I understand, is about four times an hour, one being an express non-stop service, and the other three times are for shuttle servicing the in-between intermediaries stop,” he said. Comparing to Japan’s HSR, Hutchinson said the frequency for an express non-stop trip between Tokyo and Osaka is 14 times. To recoup the investment on the HSR investment cost, Hutchinson noted that the railway owner must determine between collecting fare and non-fare revenue. “In the case of Japan, two-thirds are from the fares, and the remaining one-third is from the hotels and shopping malls that it operates,” he said. Meanwhile, an online poll conducted during the conference showed that around 68% of the participants think that the Chinese consortium will be awarded the contract to build the HSR. “The Japanese, they tend to focus on the quality of their high-speed rail, and the record speaks for itself,” said Hutchinson. The HSR will cut the travelling time between Kuala Lumpur and Singapore to 90 minutes. Yah separate issue, when the acquisition of ktm land, HSR was not even a serious plan. Shouldn't be too difficult to cancel without penalty. Just keep digging deeper and find the real reason why najib was willing to sign this deal lor. If can find wrongdoing.. then hehehe. What if along the way, cost overrun and or the company that is awarded to construct hsr went bankrupt how? It would be super headache.. Previously with najib still easy to discuss.. With new pm.. Don't think will be that easy.. Later built halfway like what I mentioned above = gg for singapore as malaysia will expect singapore to foot the excess..
Edited by Yewheng, 27 May 2018 - 04:38 PM. Frankly it is stupid to end the HSR in Jurong E (if really want to have HSR) . End it at Tuas next to check point, then no expensive digging. Build up Tuas area into a new commercial and business hub - plenty of land there, or can reclaim more. Build cheap above ground MRT to link up to that station. Personally I think improving the customs for the current land links first if saving time is the priority. Tun M is absolutely right. Since Kusje brought it up, I suspect the deal of the lands has something to do about Najib's debts. besides hsr in je will give a boost for local and international developer and investor to make je the 2nd cbd a reality! Edited by Wt_know, 27 May 2018 - 06:52 PM.